Wisdom of Life. : Do you have a poker face? Do you have a poker face? Unless you are a good poker player, you won't never have one. Imagine you have an 'ace' opened card but only a 'two' covered bottom. Can you portrait and pretend to be holding a double ace on hand? Or actually having a double ace clip, but react you are not? 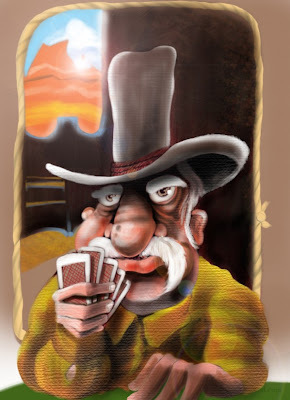 An effective good poker player, play to his advantage and could possibly win most of the time. I was a good poker player when i was in the twenties. Though i had not been playing this game for the last 35 years, i believe i still have a poker face. Similarly a good salesperson, knows how to apply his poker face on all his selling. When he meets a new prospect, he knows when to open his mouth. He has the skill to portrait how successful and professional he is or when the time doesn't permit, he could also pretend he isn't selling but deep down in his heart he wants the sales so much. That's what i called a poker face of a salesperson! A skillful poker player not only has a poker face, he could also see through other players' bottom cards as well. By observing and studying his competitors facial and reaction, he could almost analyse and assess their faults. Selling is quite the same here. A professional salesperson understands the needs and wants of his customers. Everyone has a poker face and its whether one could have a poker's mind to stand an edge over the other person. Perhaps it's my destiny and fate that i had a chance to play poker when i was young. Today the game has made me stronger in mind, when i know how to protrait and defence myself and to understand another person in front of me better. Do i still play a poker game card? No! Not anymore because i dislike to win cash among friends. Yes! I was playing the 5 cards poker and i no longer play to win money anymore. However at looking at your photo on your blog, i could see you do have a beautiful poker face. Have fun with your games.